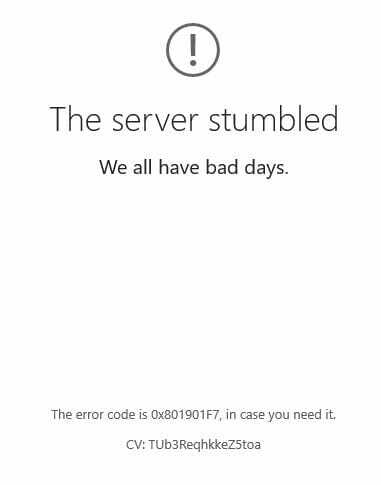 Some of Microsoft Windows users are getting “The Server stumbled Error 0x801901F7” in Windows 10. At first glance, the users might say that the problem might be from Microsoft’s servers or the network. However, upon further inspection, I have found that this is not the case. In this post, I will be discussing the step by step method of getting rid of the “The server stumbled error 0x801901F7” in Windows 10. This a bit of reading over Microsoft Answers, I realized that it is a typical Windows Store error. Which means, that if you were to clean the data and cache related to the Store, it will start working normally. We will now proceed with the steps required for clearing the cache. Press Windows Key + R. This will open the Run box. Type “wsreset.exe” and press enter. This will clear all the data present for the Windows Store in your disk. Again, press Windows Key + R and then type “C:\Users<Insert Username>\AppData\Local\Packages\Microsoft.WindowsStore_8wekyb3d8bbwe\” (without quotes). Replace the <Insert Username> with your own username and then press enter. This will open an explorer window where cached data for Windows Store is present. Press Ctrl + A and delete all the data from the folder. Now, try opening the Windows Store to see if it works or not. If it has started working, then you don’t need to proceed any further. You can now download and update any app or other items from the Store without the stumbling upon the error 0x801901F7. For those of you for whom the Store is still not working, you will have to reinstall the Store app using the PowerShell to make it work. This is similar to what I used to fix the Edge browser from closing itself automatically in a previously written post. We will now see the procedure for reinstalling the Windows Store. Press Windows Key + R and then press enter. This will open the Run box. Type “cmd” (without quotes) and press enter. This will open the command prompt. Copy and paste the following into the command prompt window and press enter. After clearing the Store cache/data and reinstalling the store itself, the Windows Store will start working correctly without showing The Server stumbled Error 0x801901F7 in Windows 10. This will surely fix all the occurrences of this error. Whether this worked for you or not, please head over to the comments section to let us know. We will surely let you know if there is another fix or not available for your particular system or not.